I wanted this editor's letter to celebrate a family reunion of sorts, complete with hugs and warm accolades that would welcome you back to our pages after our short summer break, but I struggled to find words strong enough to convey my thoughts. Even now, in mid-September, a summer of national unrest and uncertainty weighs heavy on my heart. 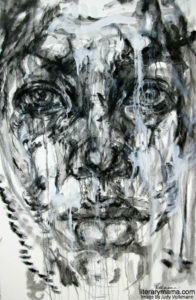 I think that's why I was struck by Judy Volkmann's art and in particular, the series she titled Faces of Humanity. In this ten-part series, Judy uses a single face to capture emotion and what it means to be human. I was especially moved by the stark blacks and whites of "Face Value," shown here, because it seems to issue some of the same challenges we make to our writers: "Dig deep. Go beneath the surface so the reader can see what you're seeing and feel what you're feeling." Judy writes that the face is not meant to represent anyone specifically, but as I sat with each one—including pieces titled "Awakening," "Enlightenment," "Disillusionment," "Captive," "Woven"—I saw myself and others I know. I recognized these faces in the pieces we've published and the comments readers have shared. I hope you do too. And I hope your reflections lead to discussions and that those discussions lead to action. I challenge you to dig deep. Welcome to our September issue. Judy Volkmann grew up in Fall River, Massachusetts and earned her bachelor of fine arts degrees in painting and art education from the University of Massachusetts, Dartmouth. She has received numerous awards, including the Ellen Batell Stoeckel Fellowship to study at Yale Summer School of Music and Art in Norfolk, Connecticut. It was during that summer, inspired by the abstract painters there, when she began to explore abstraction in her figurative work. For over 20 years, Volkmann’s art has focused mainly on the human figure and expressionism. She enjoys painting commissioned portraits for her clients, and has had her work displayed in galleries throughout the northeastern region of the United States. Her art is in private collections in Massachusetts, New York, Rhode Island, Vermont, Virginia, Maine, Pennsylvania, Florida, Idaho and California.